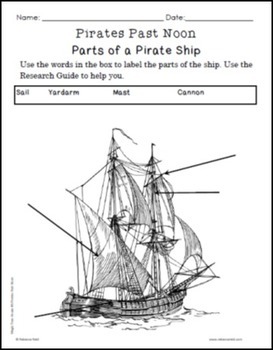 Create a report, poster, or presentation on Magic Tree House Book #4: Pirate Past Noon by Mary Pope Osborne and the related research guide, Pirates, by using these idea organizers to help students respond to the text, begin research, or prepare a project or poster about this book and about dinosaurs. If you’d like, print the collage of images to add to your report or poster. 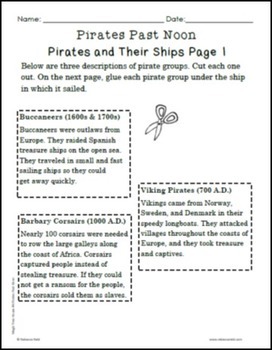 These 9 worksheets and a collage page are for your personal or classroom use. This book study does not provide comprehension questions or vocabulary, but rather provides some creative ways to think about the story and the historical content in the Magic Tree House book. Do you need something for a different Magic Tree House book or another historical fiction book? 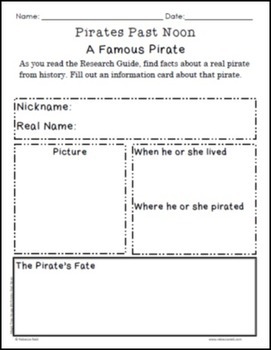 See also Book Study Historical Fiction Idea Charts and Organizers for elementary. 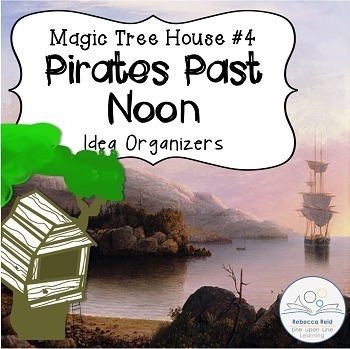 See all Magic Tree House Idea Organizers. If you like this product, make sure you come back and rate it! You get points for future purchases on tpt. This work is licensed under a Creative Commons Attribution-NonCommercial-ShareAlike 3.0 Unported License. It may be used for one teacher's use only. If you wish to share it with a friend, please purchase an additional license.